During the first week of April 2018, Sage Builders, LLC will close escrow on their newest project located at 2799 NW Horizon Drive, the 21st home that Sage has built on Awbrey Butte in Bend, Oregon. All but one of these homes were designed by Bend’s award-winning architect Neal Huston and Associates. This newest 3,200 square foot single level home will feature three bedrooms, two and one-half bathrooms, a study, a dining room, a great room, a nook, a laundry room, and an expanded courtyard entry with a three-car garage. The modern exterior will feature a multi-sloped roof design with interior ceilings ranging from 9’6″ to 14′. This home will feature walls of windows ranging from just above the base of the room to the ceiling consisting of tall windows with transom windows above. The house will also feature a partially covered concrete paver deck with low maintenance powder coated handrail. Sage selected Kristie Still of Cascade Design Center of Bend, Oregon to provide the interior finishing touches, including hardwood flooring in the entry, study, dining room, great room, kitchen, nook, and hallways. The flooring will be matched to the fireplace masonry. The kitchen will feature a solid Quartz Slab which will be complemented with an undermount sink and Moen pull-down faucet accented with a full height backsplash. The master bathroom will include a Quartz countertop with backsplash and Moen faucets setting on Kohler sinks. The flooring and shower will be porcelain. The guest bathroom will feature a Quartz countertop with Moen faucets and Kohler sinks. 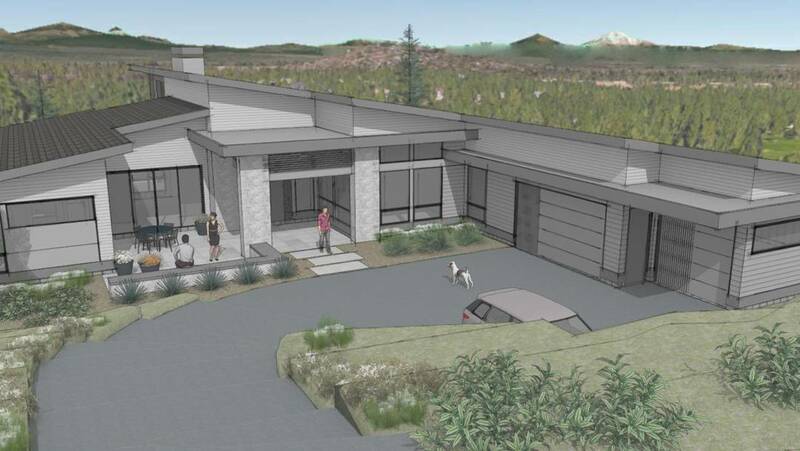 The home will also feature a full complement of built-in stainless steel appliances, including a wine refrigerator supplied by Johnson Brothers Appliances of Bend. This home on Awbrey Butte will be ready for occupancy in the fourth quarter of 2018. The pricing for this home in Bend, Oregon will be set when the home is at the drywall stage of construction.